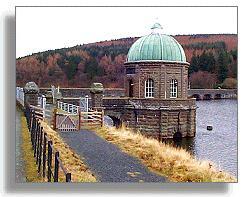 There is a small round tower with a domed roof just upstream from the submerged dam at Garreg-ddu. This is the Foel Tower, a very important building because it is the starting point for the 70 mile journey of the water supply to Birmingham. The lower section of the tower has a number of openings at different levels. A system of valves and cylinders inside the tower can be raised and lowered to draw off water from the reservoir at the right depth for the current water level. 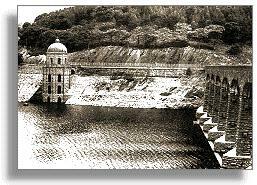 This 1947 picture shows the Foel Tower during very low water levels in the Garreg-ddu Reservoir. Most of the openings you can see in this picture are normally underwater. The top of the submerged dam of Garreg-ddu can be seen under the bridge on the right in the picture above. This low dam prevents the water level from falling below the lowest openings in the Foel Tower. The recent photograph on the right shows the more usual water level. As well as the water collected by the two dams at higher levels in the Elan Valley (Pen-y-garreg and Craig Goch) the Foel Tower takes in water from the Claerwen Valley. This is carried by a pipeline which takes water underground from the dam system in the next valley.